From a young age the city of Toronto, ON was often the destination of choice for weekend getaways. A city rich in culture, activities and food, it has remained one of my favourite cities to visit. Food festivals are always fun as they allow you discover all kinds of different types of cuisine at different price points. This past winter I had the pleasure to experience Winterlicious 2018 – you can read all about it here. With summer in full-swing it was time to plan my next culinary adventure. I started combing the web for what I should see and do in Toronto – and eat of course! With so many flights departing Ottawa daily, affordable fares and landing directly in the downtown core of Toronto, there is no better choice than Porter Airlines. Just the thought of leaving your desk after work, grabbing your Porter flight and dining in downtown Toronto that evening is just amazing. There is no doubt why Porter is my favourite airline! I boarded my flight late morning on a Friday and landed just after noon. Upon landing my Allure Management black-car service was awaiting and drove me to my hotel in style. I wish all airport transfers were this nice! I then arrived at my home for the weekend, the One King West Hotel & Residence. Having stayed there a few times before, it was an easy choice to say the least. An all-suite hotel ideally located within minutes of Toronto’s downtown business, entertainment and shopping districts, made it the perfect choice! Nestled inside of the old Toronto Dominion Bank, their bar event features some of the original teller wickets. Check-in was a breeze and my room was beautifully appointed. There was no time to rest however because I had lunch plans as it was Summerlicious after all. 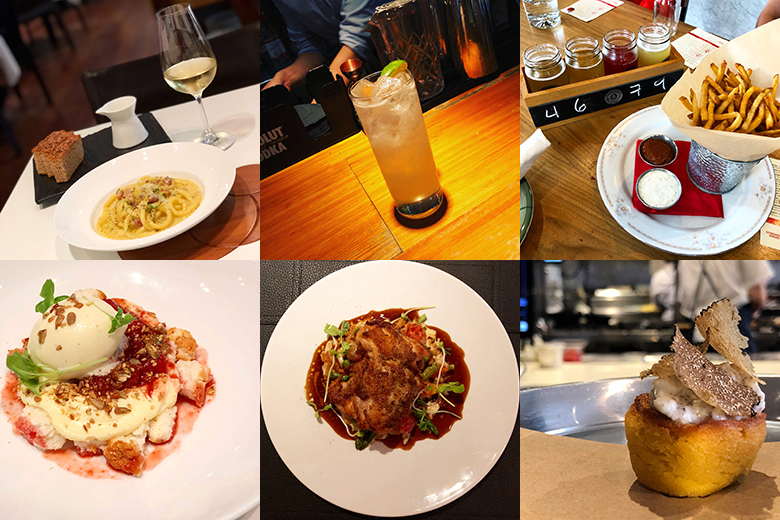 Summerlicious allows you to explore Toronto’s diverse cuisine with spectacular three-course prix-fixe menus for lunch and dinner at over 200 top restaurants! Lunch menus prices vary from $23, $28 or $33 and Dinner menus from $33, $43 or $53. My choice for lunch has been one restaurant that I have visited several times in the past and it had been a while since my last visit. Nota Bene is a beautiful, hip restaurant featuring creative Canadian plates in a contemporary setting. Their $33 Summerlicious lunch menu offered several options that were phenomenal but here are the items I chose to enjoy. All the dishes were on point and plated creatively. Chef David Lee and his team continue to impress! It was time for a quick rest to prepare for dinner. Located in the lobby of the One King West is Teller’s Bar & Lounge. This past January renowned Chef and culinary instructor Angel Sevilla took the position of Executive Chef. With Chef Sevilla in place for several months, it was time for his new menu to debut. I had the pleasure of being invited to preview his menu that launched July 16, 2018! My meal was composed of the following. 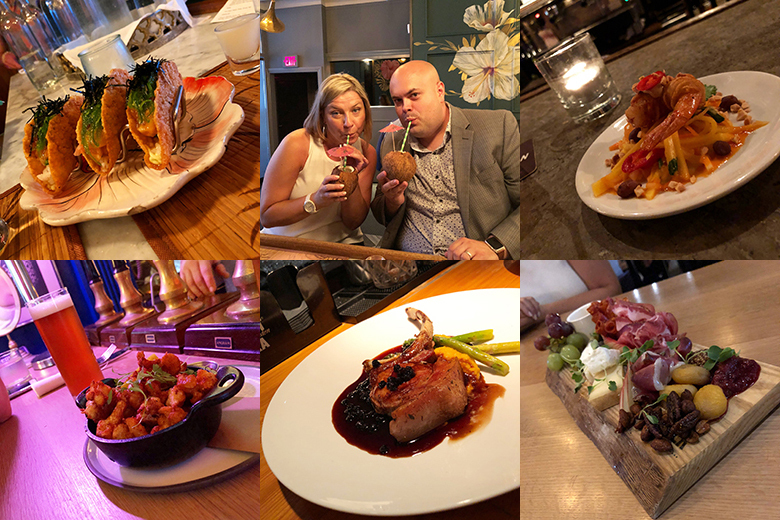 You can read all about this dining experience by reading my menu preview here. The night was young – it was time to explore Toronto by cocktail! Drink Toronto offers amazing beverage tours showcasing some of Toronto’s coolest spots to enjoy some amazing wine, beer & cocktails. Their motto – Drink. Walk. Repeat. Having had wine with all my meals that day, I knew I would appreciate some cocktails and micro-brews. I reached out to Drink Toronto and booked an amazing tour featuring just that. I met my guide and co-founder, Erin Henderson, a certified sommelier and wine educator and the co-founder of The Wine Sisters, for a night on the town. Here is a list of our stops and what we got to enjoy. I highly recommend taking one of the Drink Toronto tours for a great night out! Off to bed after this amazing day filled with amazing food and drink. Saturday morning, I woke up to a delivery from the folks over at The Original 6 of their TO6 Snapback. I really liked the design and artwork. You can order yours here. Culinary Adventure Co. offers Canada’s leading food tours and I just love their motto – Every Bite Tells a Story – so true! Not only do they offer great experiences, but they have also partnered up with Mealshare, and a portion of every admission is donated to help feed children in need! 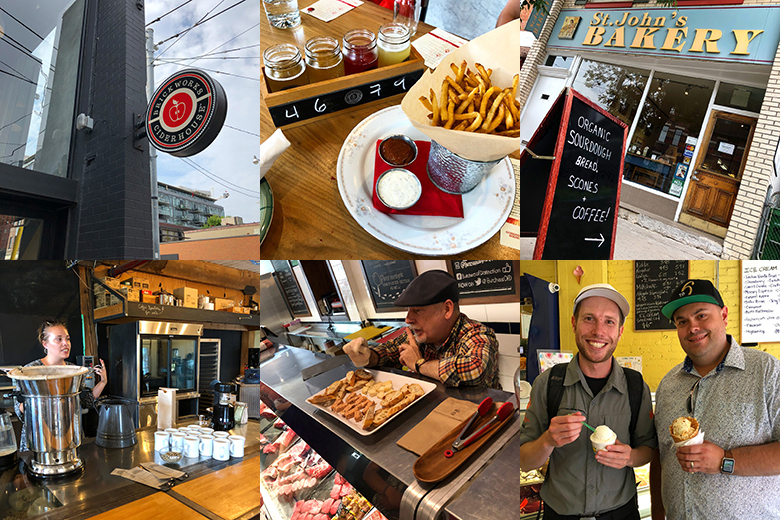 Our tour guide Leo Moncel was great and here are the places we visited during their Riverside + Leslieville Food Tour. This was a great tour that lasted just over 3 hours. There is a fair bit of walking, but you get to enjoy some great food and learn a lot about the areas covered. After heading back to my Suite, I got ready for dinner. Only a short walk from the One King West, I was quite excited to dine at Bymark. One of several creations by Mark McEwan, Bymark is nestled in the atrium of the modernist TD Towers. The beautiful modern design of the restaurant got me excited to see what creations Executive Chef Brooke McDougall had graced on the Summerlicious menu for only $53. Here are the amazing plates I was served. I had a great visit to the kitchen with Chef McDougall and I was very impressed with his passion for food and the restaurant business. That is what has made this restaurant so successful. With Saturday coming to an end, there was no way I would be able to leave Toronto the next day without, what I consider, a steak from the best steak house in Toronto, if not the World! Having already had an early dinner – this steak was going to be ordered à la carte for sure. 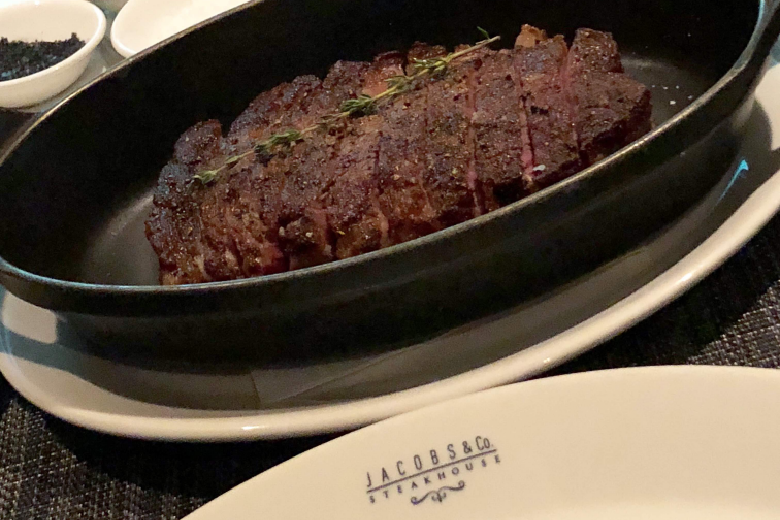 Jacobs & Co. Steakhouse doesn’t only offer the best steaks, but their service is like no other. Chef Danny McCallum and his team will impress you like you have never been before. A glass of Prosecco on the house was a nice touch but then came the key decision – what steak to choose. Cuts from across the World grace this menu. From the fields of Ontario, Canada to the fields of Japan’s Hyōgo Prefecture, there are options for every palate – and budget. I opted for a steak that was the oldest. Jacobs offers in-house dry-aged beef that will knock your socks off with deep flavour and intensity. My choice was easy, 75 Day Dry-Aged 14oz USDA Prime Black Angus from Nebraska. It simply melted in my mouth. The flavour off the charts. Outstanding. That was it for Saturday. Time for bed. Sunday morning before I headed home I had time for one last meal. Brunch was my target. I decided to visit Buca Yorkville. I’ve wanted to visit several times but just hadn’t ever been able to make it. 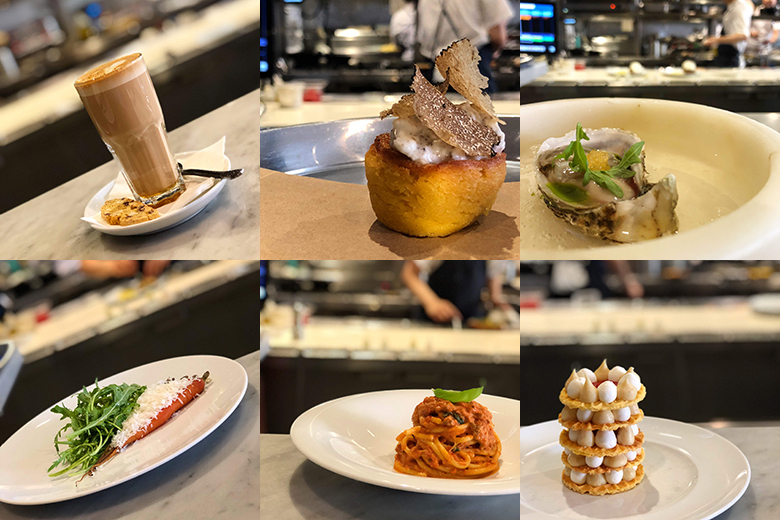 Helmed by Chef Rob Gentile, this Italian restaurant ranked 4th best restaurant in Canada on the Top 100 Restaurants list of 2018! I sat at the pass where I got to enjoy a view of the kitchen and speak with the Chefs. Here are the amazing items I got to enjoy. If that doesn’t impress you I don’t know what would! Maybe their fresh snapper crudo, carved from the whole fish tableside would do the trick? That marked my final meal on this trip – but it’s ok because I was quite content! I returned to the One King West, packed my bags, checked-out and hopped into my airport transfer. It was a beautiful sunny day so I opted for the ferry to Billy Bishop Toronto City Airport. I love the short ride overlooking the beautiful Toronto landscape. I checked-in to my Porter flight and the rest is history. Toronto you’ve done it again – a wonderful culinary adventure was had.